Critics of fiction have long been aware that the romantic movement in Europe and America gave a powerful impulse to the art of fiction. The exact nature of that impulse has resisted analysis like so much associated with romanticism. 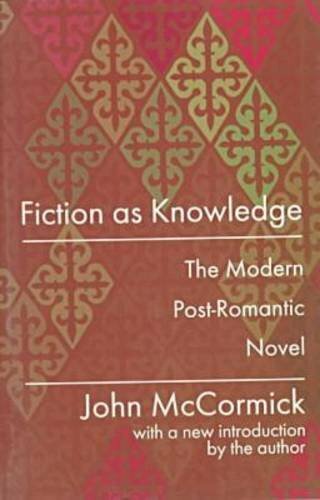 In "Fiction as Knowledge" John McCormick reaches for precision, proposing that much of the vitality of modern fiction derives from romantic conceptions of history which made available to fiction not merely historical subject matter, but new perceptions of reality, present and past, that pervade the work of many of the greatest writers of the post-romantic period. "Fiction as Knowledge" supplies critical insight into the form of the novel as well as into the seven novelists under discussion. Not least, the book is a warning against contemporary anti-historical bias and an appeal to the cultivation of historical consciousness. "John McCormick" is Professor Emeritus of Comparative Literature at Rutgers University, and Honorary Fellow of English and Literature at the University of York. He is the author of "George Santayana: A Biography, Catastrophe and Imagination, and The Middle Distance," by Transaction.